Is your hair dry and prone to breakages? Has it lost its shine? Do you struggle to pull your brush through the tangles? Have you got a spare £39.50? Do you want to look like Jennifer Aniston? 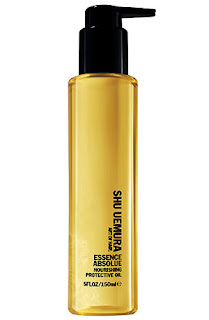 Well ok it is expensive but if you answered yes to the others you are in desperate need of Shu Uemera Essence Absolue. Traditionally the Geishas of Japan tended their hair with rich Camellia Oil to keep it soft supple and shiny. Shu Uemera have captured this oil into a treatment that nourishes and protects hair. It can be used after shampoo and conditioner to protect your hair through styling and then as a finisher when hair is dry to soften and treat. This combined with my Babyliss Big Hair has given me soft silky hair with a great shine. It smells lovely too. Don't use it at the roots though unless your want your newly coiffed locks to instantly resemble the bottom of a chip pan. Chris McMillan, hairdresser and friend of Jennifer Aniston uses it on her hair to add gloss and texture at the ends and to give a smooth finish to her blowdry. Hair like Miss Aniston's for under £40. Try Something New Today…Maybe a Skirt by Gok Wan?